Photographers often want to use the slowest possible shutter speed while still achieving the sharpest possible shot when handheld. The answer to “how slow of a shutter speed you can use” when shooting handheld is important because not getting it right results in thousands of ruined photos. Every photographer takes those thousands of blurry shots until he or she learns the limits of shutter speed. I'm hoping to save you a bit on that learning curve with this article. Now wouldn't THAT look like shareable content? Hint hint…. I'd love it if you'd share this infographic on social media–especially Pinterest. It took me a few hours to make, so I hope it's helpful. In the chart above, I consider “poor” sharpness to be where the sharpness is not good enough to publish most of the shots, even if a lucky sharp one appears now and again. “Fair” sharpness means that at least 40% of the shots are turn out reasonably sharp. “Good” sharpness means that at least 75% of the shots turn out reasonably sharp. “Great” means that almost all of the shots turn out sharp, and the general sharpness is higher than that of any of the other categories. By the way, it took me a couple hours of standing out in the freezing cold at 6:30AM in my backyard testing for this chart using camera bodies and lenses from two manufacturers to get a good general rule for each shutter speed and focal length. Obviously, your mileage will vary slightly depending on how good your technique is. I've been shooting professionally for a few years, but my hands were trembling from the cold, so you can judge for yourself if you may want to put your own general rules a little faster or slower than the chart. The simplest answer to how slow of a shutter speed you can use and still get a sharp picture is to use the 1/focal length rule. The shutter speed/focal length rule says you simply take the focal length you're shooting at (let's say 50mm, for an example), and make the denominator in your shutter speed. Simple! So if you're shooting with a 50mm lens, the rule says that you shouldn't pick a shutter speed slower than 1/50 if you want a sharp picture. So you could shoot at 1/80 or 1/100 and be just fine, but don't go to 1/40 or 1/20. Another example: if you're shooting at 200mm, the rule says you should not shoot slower than 1/200. So 1/400 or 1/640 or faster is fine, but don't choose 1/180 or anything else under 1/200. But first, at a basic level, we need to discuss WHY the shutter speed and focal length are related. I like to think of the example of holding a laser light. If you get a red laser pointer and point it against the desk in front of you, you can hold the point pretty steady. You won't see the point dancing around much. If you point the laser at a house across the street, no matter how hard you try to hold the laser steady, it will dance around wildly. You haven't changed the way you're holding the laser, and technically you were just as shaky in both situations, but the shake is exacerbated greatly by distance, which multiplies the effect. When holding a camera, the same thing happens. A minor shake when shooting wide can't be seen much because the viewer isn't zoomed in on the tiniest details. HOWEVER, when you're shooting a very long lens, the viewer sees the details and any shake in the camera muffles those details, creating a soft image. Aside from choosing the correct focal length, it's extremely important that you learn the proper way to hold a DSLR. I'm amazed sometimes when I see how photographers hold the camera. If you don't prop up the lens with the palm of your left hand, you're unlikely to get a sharp shot with a longer lens. Generally, when photographers talk about different focal lengths, they mean the focal length on a full frame camera. If you use an APS-C (so called “crop sensor”) DSLR, then you need to multiply the focal length by 1.5 (Nikon, Fuji, or Sony crop sensor) or 1.6 (Canon crop sensor) in order to get the equivalent focal length. So a 50mm lens, when put on a full frame camera is 50mm. But when it's put on an APS-C sensor, has the equivalent focal length of about 75mm. That may leave you wondering why, in the chart above, the numbers for crop sensor are all lower than those in the full frame columns. The reason is the field of view, which is the number we need for the proper calculation above. In that scenario, we are not saying that the same lens is put on both cameras, but it is trying to show what focal lengths produce the same field of view, and what shutter speeds can be used at those focal lengths to produce a sharp image. If you forget about the chart and want to just do the calculation on your own for the 1/ focal length rule, then you would first figure out the equivalent focal length, and then use the rule normally. So if your lens is zoomed to 40mm, you would need a shutter speed not of 1/40 (which is the rule for a full frame shutter speed calculation). You would multiply 40mm x 1.5 (the crop factor for your crop sensor) and get an answer of 60. Now apply the 1/focal length rule and you know you need a shutter speed of at least 1/60. If you don't want to do that calculation every time, just use the chart above. I've done the hard work for you. But also, don't turn sharpness into a math problem. The 1/focal length rule is a GENERAL rule and is not at all a perfect science. It just gives you a starting place. This is a 100% crop from some of the photos I took as I was testing this out for the chart above. I taped a piece of paper to the fence and took pictures of it. The lettering on the paper makes judging sharpness easy. You may be tempted to say that only the picture on the left is “sharp enough for your standard.” But remember that these are zoomed in all the way. If you're viewing the first three photos at a normal size on the web, you couldn't tell the difference at all between them. The chart above, and generally how photographers talk about sharpness is as if there are only two options: sharp, and blurry. That's not really the case. Sharpness is a range. The 1/focal length rule gives you an approximation for the slowest shutter speed you can go to and still get a reasonably sharp image about 80% of the time. You'll still take some blurry shots if you're at the minimum. 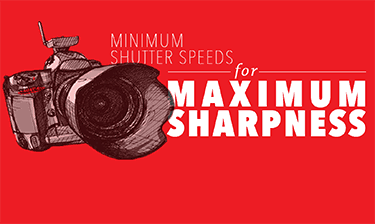 But the more interesting question is–what constitutes a “sharp” photo? If I were taking a photo that I knew was going to be printed huge, or which I was going to later crop, I would have a very different standard for sharpness than some other photos, because I'll be zooming in to see the little details. 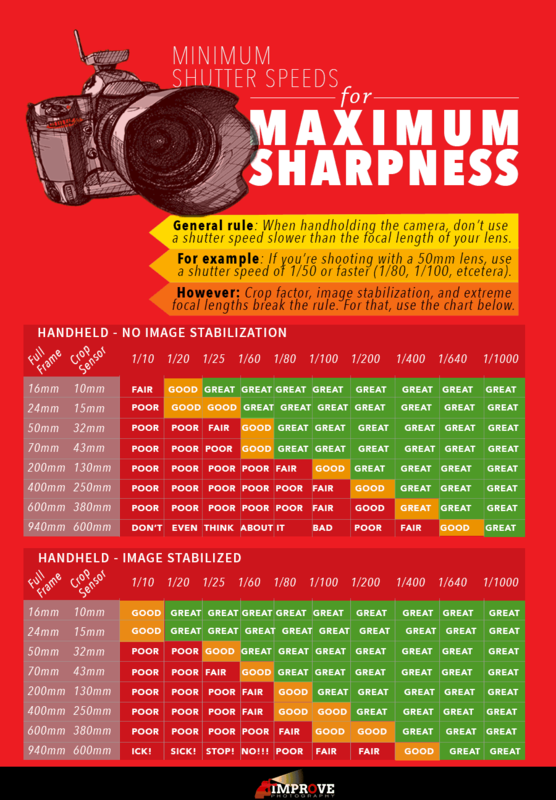 Further, as cameras increase in resolution, the standard for sharpness only increases. Only a few years ago when I started to do photography professionally, I was shooting on a 10 megapixel DSLR. Now, DSLRs commonly shoot 24 to 36 megapixel images–and higher! Since we're able to capture more fine detail, the tiniest softness in detail will be visible on the image, so the standard for sharper and sharper images has gone up dramatically. If you're shooting mission-critical images where you know sharpness needs to be perfect, do NOT shoot right at the 1/focal length rule. You'll want to click a little further on the shutter speed wheel. That's me (Jim Harmer)! 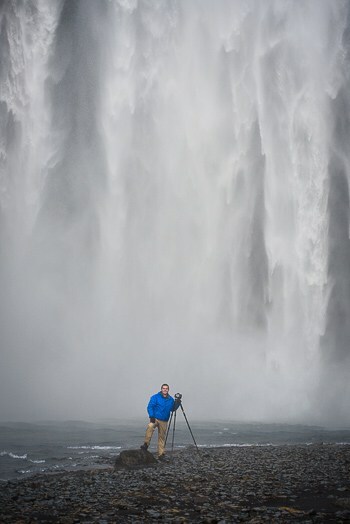 This photo was taken while I was doing a meetup with readers of Improve Photography in Iceland. The waterfall behind me was HUGE!!!! If you aren't quite 100% confident with shooting in manual mode, capturing interesting lighting in your photos, and knowing exactly how to compose your shots for a creative and solid feel, then you should really consider getting my “Photography Start” video training. It's THE most popular training I've ever produced, and has received rave reviews from those who have taken it. You can get Photography Start in the Improve Photography Store. If Photography Start isn't a good fit for you right now, then you should at least read my free Photography Basics series, where I walk you through the fundamentals of photography in a series of blog posts.